A United Launch Alliance Atlas 5 rocket blasted off from California and safely boosted a new Earth-watching Landsat into a polar orbit Monday to kick off an $855 million mission, the latest chapter in a 40-year program to monitor the planet's resources, land use and environmental changes. The Landsat Data Continuity Mission, or LDCM, got underway at 1:02 p.m. EST (GMT-5; 10:02 a.m. local time) when the Atlas 5's Russian-designed RD-180 first stage engine thundered to life and throttled up to full power with a rush of brilliant exhaust. The towering 192-foot-tall rocket, generating some 860,000 pounds of thrust, majestically climbed away from Space Launch Complex 3E at Vandenberg Air Force Base on the California coast northwest of Los Angeles. Arcing to the south over the Pacific Ocean through a cloudless blue sky, the rocket smoothly accelerated as it consumed its first-stage load of liquid oxygen and kerosene propellants. Spectacular views from an on-board camera showed the California coast dropping away in the background and a few moments later, the curve of the Earth and the black of deep space. The RD-180 shut down as planned four minutes after liftoff and the hydrogen-fueled Centaur second stage took over, pushing the LDCM satellite into a preliminary parking orbit a little more than 15 minutes after liftoff. A second one-minute 46-second "burn" was executed an hour and 10 minutes after launch to finish the job. A few moments later, the spacecraft was released into a near-circular 98-minute orbit at an initial altitude of about 430 miles. Flying around Earth's poles, the satellite's two science instruments will be able to view the entire planet as it rotates below. NASA Administrator Charlie Bolden, who watched the launch from the Vandenberg mission control center with U.S. Secretary of the Interior Ken Salazar, congratulated the NASA-ULA team for the successful flight. "Go have a bottle of wine, not a glass, a bottle! Or something," Bolden joked. "I think you really deserve it. I just want to thank everybody for the cooperation, collaboration and coordination that brought this off." The satellite's solar panel unfolded as planned a few minutes after separation, but it will take three months to activate, calibrate and check out the satellite's two science instruments and spacecraft subsystems. When the spacecraft begins routine operations it will be known as Landsat 8. 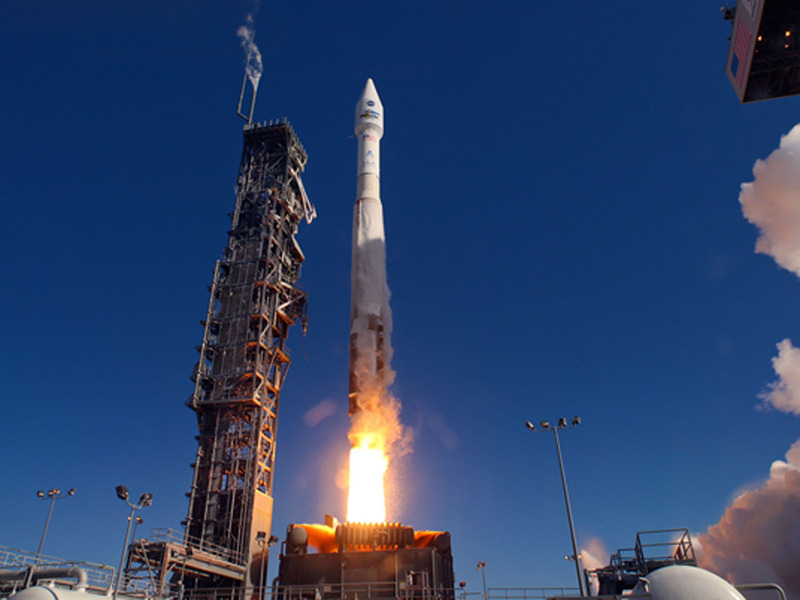 The cost of the spacecraft, the Atlas 5 rocket and operational support comes to $855 million, according to NASA. The space agency manages satellite operations while the U.S. Geological Survey is responsible for planning observations and distributing data. "There's no other satellite program in the history of our country or any other country for that matter that comes close to having the types of information and historical continuity and coverage that the Landsat mission has," said Matthew Larsen, associate director for climate and land use change at the USGS. "It advances our scientific understanding of the Earth's surface and provides comprehensive and impartial information about anywhere on the terrestrial surface of the Earth. This is critical for our ability as a nation, and other nations, to manage our natural resources." About the size of a large SUV, the 6,133-pound LDCM/Landsat 8 spacecraft was built by Orbital Sciences Corp. It is equipped with two primary instruments: the Operational Land Imager, built by Ball Aerospace and Technologies Corp., and the Thermal Infrared Sensor, provided by NASA's Goddard Space Flight Center. The two instruments will monitor Earth's surface in visible and multiple infrared wavelengths, resolving large-scale surface features and collecting some 400 images per day. The satellite is equipped with a 3.14-terabyte solid-state recorder to store data between downlink sessions. "We collect data with a spatial resolution of 30 meters, that is, every picture element or pixel in a Landsat image represents an area approximately 100 feet by 100 feet," said Jim Irons, LDCM project scientist at Goddard. "That's about the size of a baseball diamond. "So we are looking at collective change that occurs across the landscape at a broader scale. We're not so much looking in people's backyards, we look at their cities and their towns and the collective impact of people on the landscape." The Operational Land Imager uses state-of-the-art technology, including more than 7,000 detectors per spectral band, to collect continuous images along a 115-mile-wide swath. The so-called "push broom" technique is more efficient and requires fewer moving parts than the "whisk broom" technique used by early Landsat instruments, which relied on moving mirrors to sweep across the ground track. The Thermal Infrared Sensor also uses the push broom technique and high-tech devices called quantum well infrared photodetectors to precisely measure how the planet absorbs and reflects heat. "LDCM is a really important mission that will make the satellite a critical and extremely valuable national asset," said Irons. "Since the launch of Landsat 1, we have seen -- and we have caused -- dramatic changes to the global land surface that continue today at rates unprecedented in human history. These changes are due to an increasing population, advancing technologies and climate change." Irons cited tropical deforestation, urban expansion, natural disasters, glacial retreat and increased use of freshwater resources for agricultural irrigation as prime targets for Landsat observations. "LDCM will extend and improve upon the Landsat record of landscape change," he said. "The resulting observations and information will be critical to managing increasing demands on land resources and preparing for inevitable changes to the global land surface." LDCM/Landsat 8 "will be the best Landsat satellite launched to date, the best Landsat satellite ever in terms of the quality and quantity of the data collected by the LDCM sensors," he said. Data from the new instruments will be backward compatible with the output from earlier Landsats. But Irons said the two new instruments "employ technological advances that will make the observations more sensitive to variation of land cover across the landscape and more sensitive to changes in the land surface over time." For most of the program's history, the USGS charged for Landsat imagery and about 15,000 images, on average, were downloaded annually. But in 2008, the policy was changed and the image archive was made available to the public at no charge. "Since the free data policy, we've seen that number go up to about 3 million downloads per year," said Larsen. "It's really gone through the roof. What this means is we now have a robust and long dataset available to government, universities, to the private sector for analyzing land cover, land change, developing applications, scientific and resource management wise, to better manage our Earth resources." The first Landsat, originally named Earth Resources Technology Satellite 1, was launched in 1972. Landsat 7, launched in 1999, is the only operational member of the fleet and technical problems with its scan platform have affected observations.